The most immediately striking feature of this manuscript is its condition: it is from a library, subsequently incorporated into the British Library, which was damaged by fire in 1731. In the library catalogue published in 1802 is it described as '... once valuable and elegant ... [now] so much damaged as to be useless'. Careful 19th-century restoration work, however, made the volume usable again. The textual contents show that it was written for St. Kenelm's Abbey, Winchcombe, north-east of Gloucester and Cheltenham. 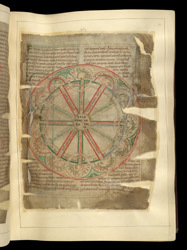 One of the most ancient means of indicating directions was by reference to winds; Aristotle identified twelve. This diagram illustrates them, each captioned with two variant names. Mediterranean sailors named winds after the places from which they came, such as Greco (from Greece) to designate the north-east, or Africus for south-west. Some were named after the gods, some after astronomical constellations, while others were identified and personified according to the weather they brought with them.